At the beginning of the twentieth century it would have been quite normal to see people sharing the road in India’s cities with bicycles, ancient tractors serving as taxis, and goat carts. Goats have been used as harness animals since antiquity. 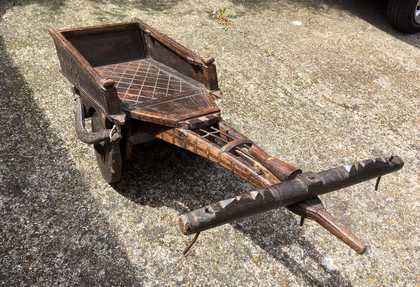 A goat cart was used for pleasure, but more importantly, under the direction of a groom, because they’re smaller and closer to the ground than a horse, an ox, or a camel, a boy could harness one and drive it, learning the art of driving so necessary at that time. We found this one in a small shop outside Jodphur. £140. Only available in our Hove store.